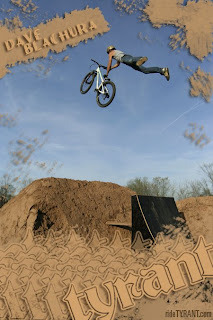 A local Middletown MTB shredder, Dave Blachura has been going big for years and 2009 looks to be full of lots more high flying action! Dave will be getting flow from Sinister Bikes and will be repping TYRANT threads as he travels the East Coast killing it on dirt this year. Dave and I will be working on dirty shirt & hat designs in the near future and some rad frame decals. This Summer should be fun as hell traveling to contests watching Dave huck himself toward a podium spot. Best of luck dude and thanks for the support!